We're used to singer/guitarist Becky Black and drummer Maya Miller being on the same side, but the Pack A.D. musicians play rival members of warring gangs in their new clip for "Rocket." 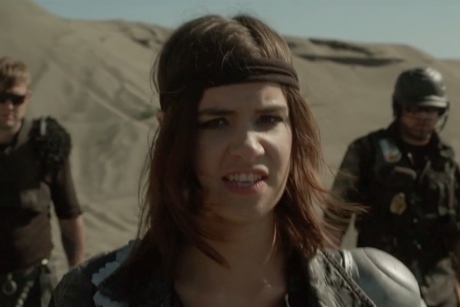 The Jimi Cuell-directed clip for this garage-y alt-rock cut takes place in the desert, where Black and Miller both lead their own post-apocalyptic gangs of outlaws. All of the gang members are quickly killed off, with the battle culminating in a surreal showdown between the bandmates. Watch it below. The song comes from this year's Do Not Engage. See the Pack A.D.'s upcoming tour schedule below. It includes a number of dates opening for Alice in Chains, as well as shows with Tokyo Police Club and Said the Whale.